Get that down-payment on the Lamborghini ready, rock-star investor, as the bull market will unlikely die in 2018. Or so says yet another bullish note from a Wall Street firm, in this case Bank of America. Equity strategists at the investment bank hiked their 2018 target for the S&P 500 to 3,000 from 2,800 on Tuesday. The S&P 500 currently trades at about 2,836, up 6% so far on the year. Investors have aggressively bid up large-cap stocks such as Netflix (NFLX - Get Report) , Action Alerts Plus holding Apple (AAPL - Get Report) and Boeing (BA - Get Report) this year on optimism around corporate tax reform. Meanwhile, a strong start to M&A has sent smaller cap stocks across many industries, notably healthcare with names like Celgene (CELG - Get Report) acquiring Juno Therapeutics (JUNO , soaring. Total M&A deal value has gained an impressive 20% year over year to $239 billion, according to data from Dealogic. 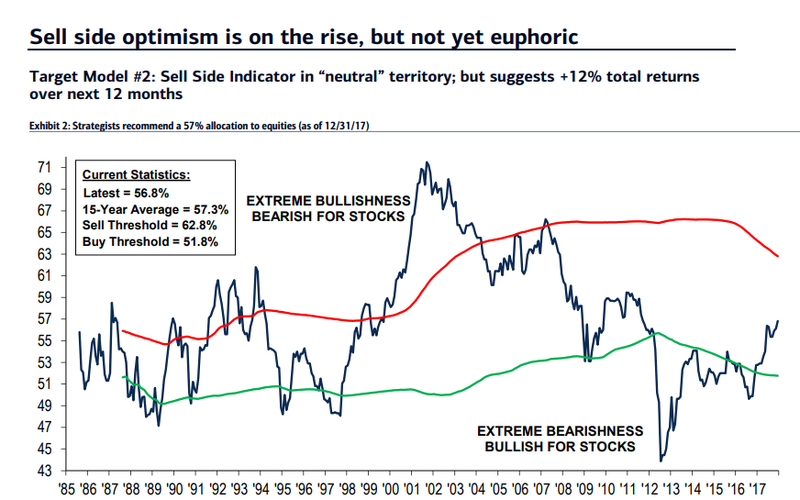 "While 2017 saw building optimism, 2018 may be the year of euphoria," says Bank of America. "While valuations have overshot fair value, sentiment is likely to be the most important driver of returns − typical of late-stage bull markets." Cash positions among investors have dived to a five-year low, notes Bank of America.